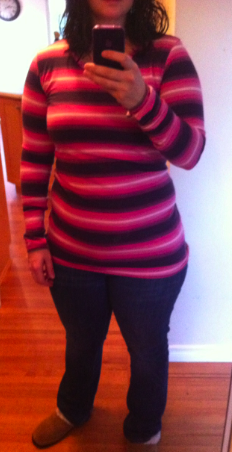 I happened to find the Pink Ombre Stripe Cabin Tee Long Sleeve over at the Oakridge Lululemon this weekend and I have to say it is my favorite of the three Ombre Stripe Cabin LS’s by far. 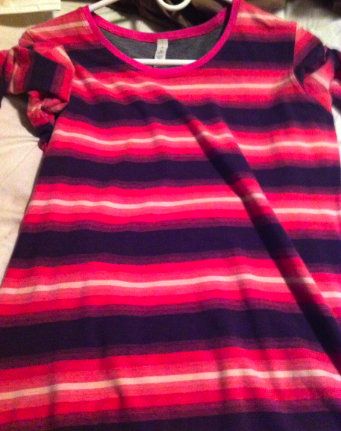 It doesn’t photograph true though because it looks quite bright in the photographs and all you see is the contrast between the Black Swan and Paris Pink, and although it IS bright in person you also see the softer pink micro stripes mixed in with the white and some of the other detail that just gets lost in pictures. Definitely a goodie. Also, if you hadn’t already read these articles (CEO of the Year: Christine Day of Lululemon, Globe and Mail and Lululemon Athletica Combines Ayn Rand and Yoga, New York Times) head on over and have a read. My blog gets mentioned in both of those which is pretty darn cool. The New York Times also linked to another blog written by a marketing professor (Mixing Business and Beliefs) that offered an interesting view point about the Who Is John Galt? ad campaign that Lululemon used. Notice that lululemon is now using the white Christmas shoppers instead? I also just wanted to clarify about my posts on lululemon black friday/cyber monday. I speculated about the possibility of a Cyber Monday upload based on this CBC News Article which I linked to in my post over here. The expectation for a Cyber Monday upload was further encouraged over on the Lululemon facebook page where hints were made throughout the week that we should expect something for Monday and that we should ‘keep checking back’. Customers have been asking on the facebook page all week for a clarification of what to expect. It has come to my attention that since customers are asking lululemon employees about cyber monday deals and are disappointed in what was uploaded (not a sale but in fact exclusive items with very exclusive prices -of course, after they built up the hype all week) they are being told that the ‘rumor’ was started by bloggers, not them. I just wanted to clarify that the ‘rumor’ was started by the CBC News (a respectable news publication) and perpetuated on the main lululemon facebook page throughout the week, I simply published what was already written and unfortunately I perpetuated the hype build up for a very disappointing upload. "Special ‘Cyber Monday’ Upload is Up!" "Store Report: Special Edition Cuddle Up, Sparkle Paris Pink Cuddle Up, Gratitude Wrap and More"